The slightly milder weather, plus having a nasty cold, has prompted daily tea drinking to commence in my house! In the morning to wake me up, at night to relax me, I can’t get enough of it! Of course, that means I need to pay a little extra attention to my teeth because tea is notorious for staining! 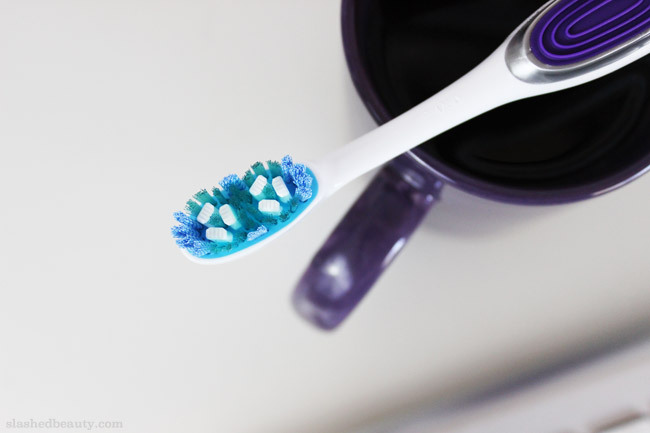 When I went back to school a couple months ago, I showed you how I was streamlining my morning routine, including using the new Colgate Optic White Toothbrush + Whitening Pen to do teeth cleaning and whitening in practically one step. Just wanted to throw a quick update at you so you know how it worked out for me! After I started using it, I saw my teeth get a little brighter within a week— not like, blinding white or anything, but definitely less yellow. As I’m drinking more and more tea, I can also say that I don’t see the dulling that I’ve come to expect around this time of year due to my drink of choice. The feeling of the whitening gel took a little getting used to, but the slippy feeling goes away after only a couple minutes so you don’t have to worry about having to rinse. You can really just brush, whiten, and go. I also liked the angled bristles in the toothbrush, which felt like they were getting in all the nooks and crannies to clean and polish my teeth! I think this would be perfect for those like me who like drinking teas throughout fall and winter, or even coffee (and sodas too!) who want to combat further staining and lift some pre-existing light surface stains. 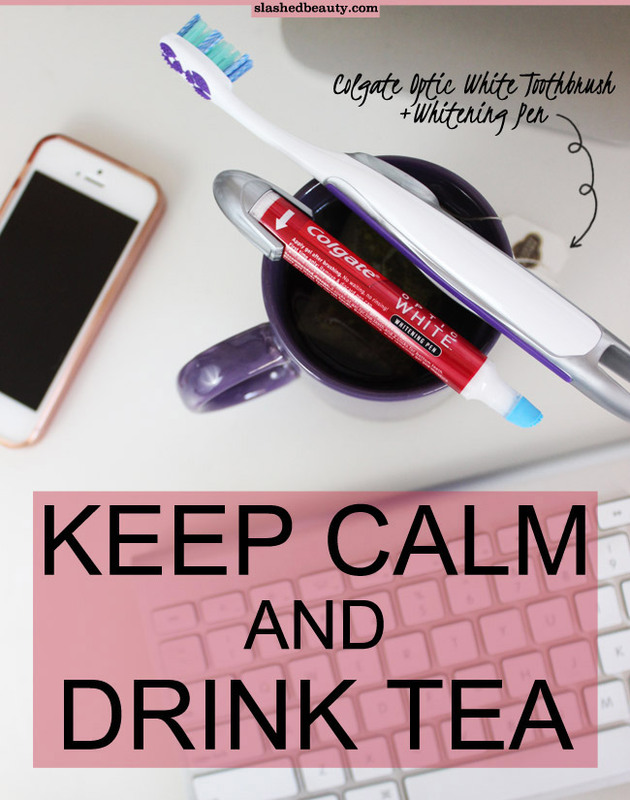 If you’re as obsessed with warm winter drinks that aren’t so teeth friendly like I am, maybe you want to enter my giveaway to win the full Optic White Regimen, including the Colgate Optic White Toothbrush + Whitening Pen, Colgate Optic White Express White Toothpaste, Colgate Optic White WhiteSeal Mouthwash! Use the widget below to enter, the giveaway ends a week from today, on October 22 at 11:59pm. 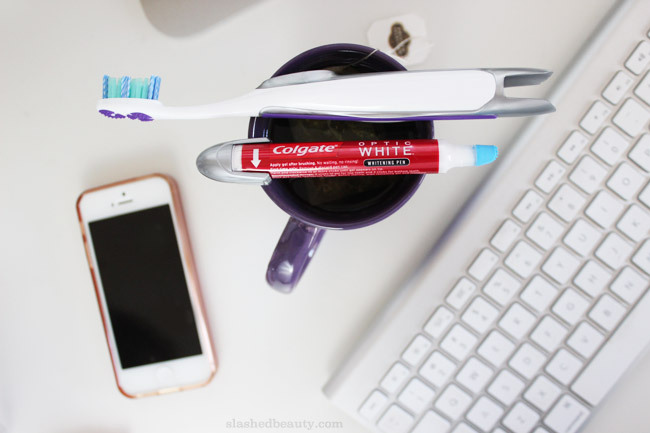 How does the Colgate Optic White Toothbrush + Whitening pen fit into your daily beauty routine? Share your experience here and check out what other products Colgate Optic White has to offer! I definitely wanna try this. I’m a coffee drinker so I could definitely use these. I am a green tea and tea-with-milk person so I need to whiten my teeth regularly. I am a tea addict! Need to try this out for sure. thanks for the update (and the giveaway!). glad to know it works! 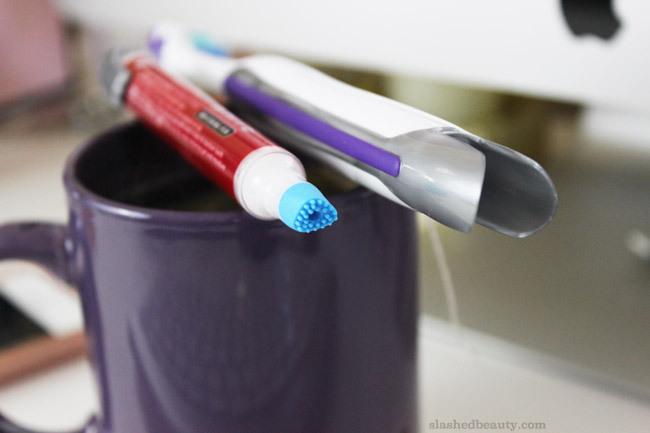 i need a new toothbrush and i like the idea of the whitening pen right there – so handy! I need to get this or at least win it. I get tea stains too and that Colgate pen works magic! I love this so much! Great giveaway! It’s pretty cool the whitening pen is attached to the brush. I used one of these, and really liked that I saw results in about 3 days. I found that using the pen and then sticking it back into the brush made it get pretty stinky, though. I just started using my set and I like it so far, yay! I drink coffee by the gallon so I could use these. My dentist is making waaay too much money on me these days. I was wondering about the whitening pen. Thanks for the update! I like the idea behind the whitening pen. I would definitely try that out!